Christmas lights are twinkling all along the Outer Banks so grab the kids, and this list, and head out for some bright holiday cheer. Know of a lights display not listed here (hello Hatteras Island! ), email kari@outerbanksvoice with an address, and photos if you have them. 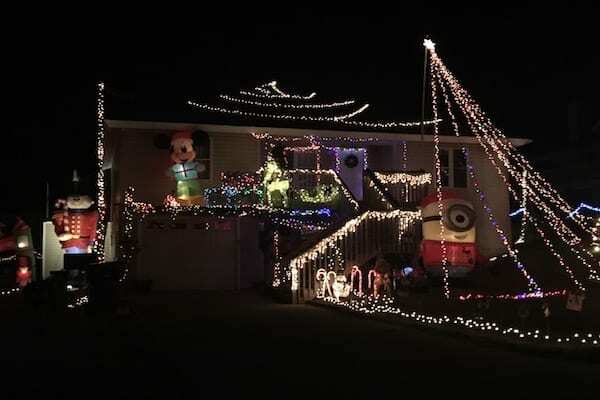 Lots of colorful lights and glowing inflatables tucked in a quiet neighborhood on Lunar Drive. 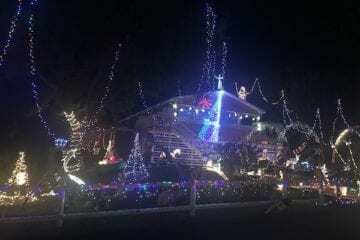 Hands of Gold Home Improvements and the Beach Food Pantry have paired up to bring a dancing lights show to the Mennicucci family home on in Kill Devil Hills, for a good cause. Stop by and bring non-perishable food, personal care items or a donation for the Beach Food Pantry. Lights are on from about 5:30 p.m. to 10 p.m. each night. All donated items will be given to the pantry on Dec. 26. The frog pond at Aviation Park is decorated with festive lights, reflecting off the water for an especially nice effect. For 49 years, since they were newlyweds, Jim and Ann Poulos have turned their home into a winter wonderland for Christmas. The Christmas display in their yard on Ocean Acres Drive just outside Nags Head Woods Preserve continues this year in honor of Ann, who died earlier this year. Manteo is dressed up for Christmas, with lights twinkling on boats at the marina, strung between buildings and wrapped in trees. 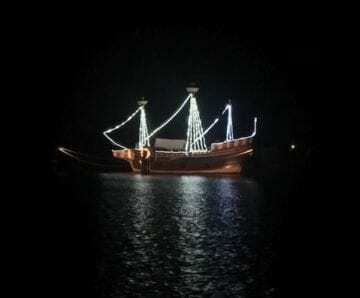 Across Shallowbag Bay shines the Elizabeth II at Roanoke Island Festival Park, lined in white lights. It’s a Dillon Christmas on Wingina Avenue in Manteo. Lights timed to music, with additions every year. Check out the family’s Facebook page here. An elaborate display set to music lights up the night in Manns Harbor, with houses across the street decked out in their Christmas best, too. Worth a drive over the bridge. Disappointing that you didn’t put Seventh Ave in KD on this list. You should include 16 7th Ave in Southern Shores with your listing of Christmas decorations to see. It’s got to be the largest display of Christmas inflatables on the OBX! These photos don’t do it justice. In my previous post about 16 7th Ave I should have noted it is in Southern Shores.